Take a dive into the Mac Speedup Pro virus issue on Mac that’s upsetting numerous users with fake scans, annoying popup alerts, and big system footprint. The niche of fake system utilities is somewhere near the top in the hierarchy of Mac malware. Although this long-running category of infections has hit the headlines multiple times, users keep getting on the hook in pursuit of keeping their machines virus-free and performing at their peak. Also referred to as scareware, these culprits have evolved into a real scourge over the years, with new variants regularly superseding the ones that gained too much notoriety to continue thriving. Mac Speedup Pro is a virus exemplifying this lifecycle. It follows a logic that boils down to convincing the victim that their Mac is neither safe nor properly optimized. In this activity, the infection fits the mold of its predecessors from the same family of rogue apps, such as Advanced Mac Cleaner. What’s more, it features just about the same GUI as its prototype. Following the furtive trespass, which will be described further down, Mac Speedup Pro spreads its tentacles throughout the system by dropping core files into multiple directories. Whilst regular apps need to request administrative permissions in a forthright way to do this, the virus obtains sufficient privileges without actually asking. Among the other persistence mechanisms, it configures the contaminated host to launch the rogue executable during startup. Then, the parasite displays a scan screen that looks realistic due to the progress bar and the imitation of dynamic threat lookup. Its features are broken down into three sections: Cleaners, Utilities, and File Managers. When running its phony scans, the impostor program ostensibly focuses on problems with redundant cache, system logs, unused languages, duplicate and large files, unnecessary login items, and potentially fingerprintable Internet history. Mac Speedup Pro may re-infect your Mac multiple times unless you delete all of its fragments, including hidden ones. Therefore, it is recommended to download Freshmac and scan your system for these stubborn files. This way, you may reduce the cleanup time from hours to minutes. Download NowLearn how Freshmac works. If the utility spots malicious code, you will need to buy a license to get rid of it. Even on a brand-new Mac that hasn’t been in use, Mac Speedup Pro will definitely claim to have found numerous issues by nearly all of the above-mentioned areas. To make this activity reminiscent of something genuine, the offending app will report some real browser cookies along with absolutely imaginary issues. However, it will flag those generally benign items as critical in order to pressure the victim into addressing the pseudo predicament as soon as possible. All in all, the junk utility’s scans will return bogus results, emphasizing that gigabytes of free disk space can be released and quite a few privacy concerns can be tackled in the click of a mouse. Guess what this click implies? The user will have to unlock full functionality by purchasing the hypocritical app’s license. This is the ultimate objective of every single Mac scareware out there. In order to enhance the manipulative maneuvers, the virus will add some popup alerts to the mix. These will be splashing up at predefined intervals, stating that the Mac’s productivity is terribly low and the current security status leaves a lot to be desired. So much for the tactics of Mac Speedup Pro when it’s on board an Apple computer. What about the installation? Those infected can’t remember having authorized any such apps to get in, which explains their bewilderment after seeing the irritating scan appear out of the blue for the first time. In fact, the contamination technique is quite vanilla. The intruder is doing the rounds through a trivial bundling hoax. It means that the user installs some nifty freeware without a second thought, and in the meantime the virus sneaks inside as part of the same setup client. Common sense suggests that selecting the custom installation option is the way to go in such scenarios. This method allows for unchecking the potentially unwanted extra entities, yet many people proceed headlong with the default setup, only to get infected with Mac Speedup Pro and suffer the consequences outlined here. If this is the case and the pest is wreaking havoc with a Mac, the instruction below will help remove it completely. When confronted with malicious code like the Mac Speedup Pro virus on Mac, you can neutralize its toxic impact by leveraging a specially crafted system utility. The Freshmac application (read review) is a perfect match for this purpose as it delivers essential security features along with must-have modules for Mac optimization. This tool cleans unneeded applications and persistent malware in one click. It also protects your privacy by eliminating tracking cookies, frees up disk space, and manages startup apps to decrease boot time. On top of that, it boasts 24/7 tech support. 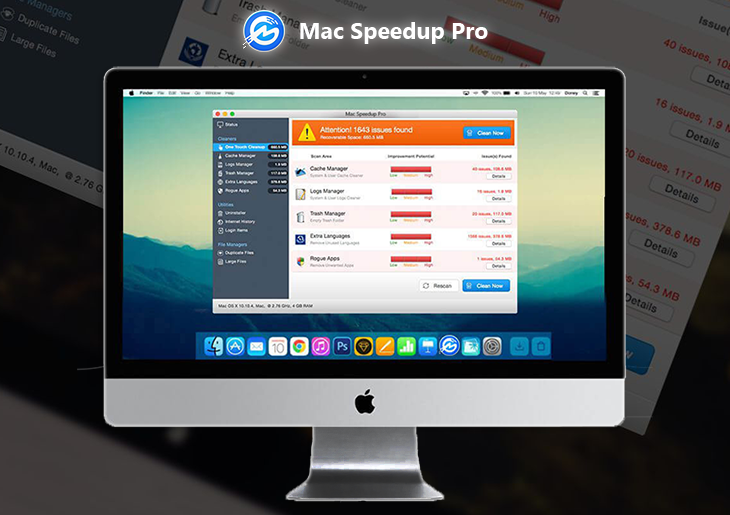 The following steps will walk you through automatic removal of the Mac Speedup Pro infection. Check whether the Mac Speedup Pro popups issue has been fixed. If it perseveres, go to the Uninstaller option on Freshmac GUI. Locate an entry that appears suspicious, select it and click Fix Safely button to force-uninstall the unwanted application. Go to Temp and Startup Apps panes on the interface and have all redundant or suspicious items eliminated as well. The Mac Speedup Pro malware shouldn’t be causing any further trouble.